Tell us what you need. Our cabinets are custom tailored to your needs, your personal tastes and the space in your room. Our cabinetry is hand-crafted by Amish artisans to meet your needs and exceed your expectations for quality, beauty and durability. You will select your wood/finish, the door style, and hardware to create your ideal room. First select your bed cabinet features, then add side cabinets, desks, wardrobes and other accessories until you reach perfection! See all your options below. Contact us with any questions you may have, or to schedule a free in-home design consultation. Our most popular panel door which folds down as one unit as the bed is lowered. you simple engage the legs as you lower the bed. Our original bi-fold doors which open to each side allowing the bed to fold down. Sliding bookcase doors. These doors slide to the sides to reveal a bed ready to pull down on a plain front panel. This style bed must include purchase of two side cabinets/bookcases for the sliding doors to work properly. Select no trim, rounded surface trim, shaker-style surface trim or routed hardwood trim (for bed cabinets and accessory cabinets). We offer extensive options on handles and pulls to compliment your personal style! (There are too many to list here) Please call us 859-325-9875 and we can bring out a catalog with hundreds of options for you to consider. The efficiency of any room can be enhanced with the addition of accessory cabinets, wardrobes, and custom-built desks. Each of our basic matching side cabinets offer a base with a cabinet door or three drawers. 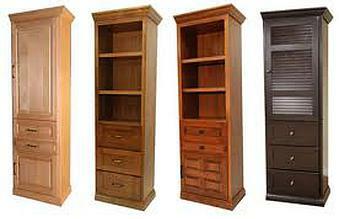 Cabinet sizes vary based on customer space and needs. Have your custom Murphy Bed and accessory pieces professionally installed for an affordable labor charge! Are You A Craftsman Yourself? We offer our high-quality Murphy Bed frames for those do-it-yourself types who want to make their own cabinet enclosures. Just call for a quote. If you want information on prices for options, contact us today via the website or give us a call at 859-325-9875.